NBIA characterizes a class of neurodegenerative diseases that feature a prominent extrapyramidal movement disorder, intellectual deterioration, and a characteristic deposition of iron in the basal ganglia. The diagnosis of NBIA is made on the basis of the combination of representative clinical features along with MR imaging evidence of iron accumulation. In many cases, confirmatory molecular genetic testing is now available as well. A number of new subtypes of NBIA have recently been described, with distinct neuroradiologic and clinical features. This article outlines the known subtypes of NBIA, delineates their clinical and radiographic features, and suggests an algorithm for evaluation. Before the widespread availability of MR imaging, a diagnosis of NBIA could be made only at the time of autopsy. In contrast, current diagnosis is facilitated by evaluation by using both T1- and T2-weighted sequences. As a paramagnetic substance, Fe3+ catalyzes the nuclear spin relaxation of neighboring water protons. With standard clinical parameters, areas rich in iron appear hypointense on T2-weighted sequences, and isointense on T1 sequences. T2*-weighted acquisitions (gradient-echo sequences) may accentuate this degree of hypointensity (“blooming”) and may be helpful in identifying NBIA disorders as may susceptibility-weighted images.1 In biologic iron-oxides, Fe2+ typically has fewer unpaired electrons than Fe3+ and is less effective in quenching T2-weighted signal intensity.2 Calcium may also appear isointense on T1 and hypointense on T2-weighted sequences, mimicking the appearance of iron. The 2 minerals are readily distinguished by CT, however, because Ca2+ characteristically appears hyperintense to the surrounding brain parenchyma, while iron is isointense. In addition, iron typically appears markedly hypointense on both standard clinical diffusion-weighted and apparent diffusion coefficient sequences. Other metals that may be deposited in neurodegenerative disorders, such as manganese and copper, have a distinct appearance on T1- and T2-weighted sequences, enabling a heuristic approach to diagnosis based on MR imaging parameters. The characteristics of these metals are summarized in Table 1. Despite the utility of MR imaging in this setting, it does not preclude the need for elemental analysis of neuropathologic specimens; rather, it enables putative diagnosis to be made during life. The radiographic appearance of the lesions themselves is of prime importance. Iron deposition occurs in multiple sclerosis,3 human immunodeficiency virus dementia,4 Freidrich ataxia,5 and Alzheimer and Parkinson diseases,6 though to a lesser degree than that seen in NBIA (Fig 1). 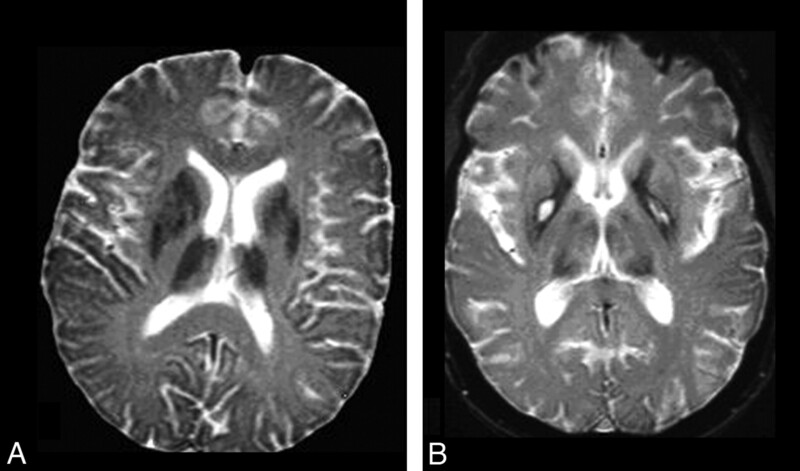 As a neurometabolic disorder, NBIA leads to an approximately symmetric distribution of iron in key gray matter nuclei that are themselves intrinsically enriched in their iron content in healthy individuals (globus pallidus, substantia nigra, red nucleus, dentate nucleus, putamen, and thalamus).7 In contrast, although intracranial hemorrhage may lead to T2-weighted hypointensity, the breakdown of heme-containing moieties is unlikely to lead to a symmetric discoloration of the basal ganglia. Instead, it is more likely to lead to a variegated appearance, depending on the stage of the hemorrhage, and to gradually resorb with serial imaging. In some cases, the appearance of striatonigral calcinosis may mimic that of NBIA, and deposition may be remarkably symmetric,8 making it difficult to distinguish the 2 entities. In such cases, CT may be helpful. T2-weighted MR imaging appearance of a healthy 60-year-old woman (A), a 66-year-old woman with idiopathic Parkinson disease (B), and a 16-year-old female patient with idiopathic NBIA (C) obtained on a 1.5T scanner by using standard clinical TEs and TRs. Most interesting, iron deposition detectable by MR imaging may precede the development of clinical symptoms, as evidenced by the identification of an “eye-of-the-tiger” in presymptomatic mutation-positive siblings of children affected by PKAN.13 In contrast, children with INAD may develop iron deposition later in their disease course or not at all.14 The observation that the degree of iron deposition correlates incompletely with clinical symptoms suggests that though iron is a useful neuroimaging feature in NBIA, it likely is neither necessary nor sufficient to produce the disease phenotype. This has important clinical implications because clinical trials are currently underway for deferiprone, a chelating agent known to traverse the blood-brain barrier.15 Deferiprone has been shown to reverse iron deposition in Friedreich ataxia, associated with an appreciable decrease in iron content as measured by MR imaging.12 It remains to be seen whether this agent will have a similar effect in NBIA and whether decreasing the brain iron burden will affect patients' clinical courses. All of the NBIA disorders feature iron deposition in the globus pallidus but differ in the co-occurrence of other findings. They are unified by the clinical constellation of a movement disorder and neurodegenerative course. All are autosomal recessive except for neuroferritinopathy. However, disease onset is variable and may range from early childhood to old age. Clinical features and severity may vary with the age of onset and the nature of the underlying mutation, though genotype-phenotype correlations are incomplete.14 Idiopathic forms of NBIA, whose responsible genes await identification, may account for up to 40% of cases. An algorithm describing an approach to diagnosis using clinical and neuroimaging features is presented in Fig 2. A clinical- and neuroimaging-based algorithm for evaluating patients with suspected NBIA. BG indicates basal ganglia; WM, white matter; FFF, facial-faucial-finger. PKAN is caused by mutations in PANK2.16 PKAN is the most frequently encountered subtype of NBIA, though still a rare disorder, with an estimated prevalence of ∼1:1,000,000. Classic PKAN begins in childhood, with profound dystonia, dysarthria, spasticity and pyramidal tract signs, and pigmentary retinopathy, leading to night blindness and visual field constriction. Intellectual deterioration is variable and tends to be more severe in those with earlier disease onset.17 In later onset atypical forms, dystonia often manifests with prominent orobuccolingual action-induced eating dystonia. Parkinsonism (rigidity, bradykinesia, palilalia, and freezing) and prominent neuropsychiatric features, such as hyperactivity, impulsivity, obsessive-compulsive disorder, and vocal and motor tics, can be seen, as well as depression and anxiety. Seizures and peripheral neuropathy are not typical of PKAN. MR imaging reveals evidence of iron deposition in the globus pallidus and, to a lesser extent later in the disease, the substantia nigra. In addition, the so-called eye-of-the-tiger sign is virtually pathognomonic of the disorder. The eye-of-the-tiger is produced by a T2-weighted hypointense globus pallidus with a central anteromedial region of T2 hyperintensity (Fig 3). Histopathologically, the “eye” corresponds to a region of profound rarefaction surrounded by relatively more preserved iron-laden neuropil, neurons, and astrocytes.18 Other forms of NBIA have been purported to exhibit an eye-of-the-tiger1,19 but feature subtle differences in the appearance of the globus pallidus lesion, including asymmetry, irregular contour, and lateral displacement (Fig 3 versus 4). The central T2-weighted hyperintensity in PKAN may become more intensified with time, appearing to consolidate on serial imaging studies,20 or it may fade with time.21 This latter scenario may contribute to some of the cases of PKAN that do not have the typical eye-of-the-tiger appearance.21 Multiple-system atrophy,22 cortical basal ganglionic degeneration,23 multiple sclerosis, and neurofibromatosis may also cause similar-appearing lesions but typically differ in their clinical presentation, course, and/or associated imaging features. Conditions that lead to an eye-of-the-tiger-like appearance in non-NBIA disorders characteristically lack the T2-weighted hypointensity indicative of iron deposition. White matter abnormalities are conspicuously absent in PKAN. PKAN. A and B, The eye-of-the-tiger sign begins with T2 hyperintensity within the globus pallidus. C and D, Iron subsequently accumulates with time. Cerebral and/or cerebellar atrophy and white matter hyperintensity are not typical features. NFT. A, Patchy hypointensity is typically seen within multiple deep gray nuclei, including the caudate, putamen, globus pallidus, and thalamus in symptomatic cases. B, Concurrent T2 hyperintensities (cavitation) may be seen within regions of hypointensity. Images courtesy of P.F. Chinnery. Mutations in the gene encoding calcium-independent phospholipase A2 (PLA2G6) lead to NAD,24 which is subdivided into INAD and later-onset atypical forms. INAD is typified by developmental arrest, then regression of language and motor skills. Affected children are profoundly hypotonic and later develop a progressive spastic quadriplegia with pyramidal dysfunction. Optic atrophy leads to loss of visual acuity and ultimate blindness. Dementia is usually relentlessly progressive. A progressive peripheral neuropathy leads to hyporeflexia. Seizures sometimes occur. Dystonia tends to be milder than that in PKAN but may occur. Ataxia/dysmetria may also be seen. Atypical NAD may present with progressive spasticity, ataxia, and dystonia, along with optic atrophy, peripheral neuropathy, and cognitive impairment. Radiographically, NAD often features iron deposition in the globus pallidus. The substantia nigra may also be affected. Significant atrophy of both the cerebellar vermis and hemispheres is a frequent feature and typically precedes iron accumulation (Fig 5). Confluent T2 hyperintensities in white matter may be observed, though these are less prominent than in some other forms of NBIA. NAD. Iron deposition may be seen in the globus pallidus (A) and the substantia nigra (B) on T2* and T2 images. C, Confluent white matter hyperintensities may be seen on fluid-attenuated inversion recovery sequences as well. D, Global cerebellar atrophy is a frequent feature. Neuroimaging of NFT may demonstrate high T2 signal intensity in the basal ganglia early in the course of the disease. This may be mixed with low T2 signal intensity indicative of iron deposition at later stages. However, in general, excess iron deposition becomes evident in the putamen, globus pallidus, and dentate nucleus (Fig 4). The caudate and thalamus may also be involved. Cystic cavitation evolves with time and may be preceded by hyperintense T1-weighted signal intensity, particularly in the putamen and globus pallidus. Mild cerebral and cerebellar atrophy may be seen. Loss of function mutations in the CP gene, encoding the protein ceruloplasmin, lead to misregulation of both systemic and CNS iron trafficking because ceruloplasmin is critical for the function of ferroportin, a cellular iron exporter.27 Ceruloplasmin also has ferroxidase activity, which plays a role in iron mobilization.28 This leads to both CNS and peripheral iron deposition. ACP mutation-positive individuals typically develop symptoms in mid-adulthood. Clinically, affected patients may have blepharospasm, chorea, craniofacial dyskinesias, ataxia, and retinal degeneration. Diabetes and liver involvement are common complications putatively related to iron deposition in the viscera. T2-weighted hyperintensity in white matter may be prominent. Serum studies typically demonstrate undetectable ceruloplasmin and reduced copper levels and often demonstrate depressed serum iron levels and a microcytic hypochromic anemia as well as elevated ferritin. Similar to what occurs in NFT but in contrast to most other forms of NBIA, widespread brain iron deposition develops in ACP, with MR imaging evidence of involvement of the caudate, putamen, globus pallidus, thalamus, red nucleus, and dentate (Fig 6). Cerebellar atrophy may also occur as well as hypointensity on T1-weighted imaging in regions of T2 hypointensity. ACP. A and B, More homogeneous iron deposition is seen within the basal ganglia, with juxtaposed confluent white matter hyperintensities on T2-weighted sequences. Images courtesy of H. Miyajima. FAHN is a recently described NBIA subtype caused by mutations in FA2H.29 FAHN typically begins with focal dystonia and gait impairment. Ataxia follows, and dysarthria and progressive spastic quadriparesis with pyramidal tract signs develop. Strabismus and nystagmus may ensue, along with optic atrophy leading to progressive loss of visual acuity. Intellectual performance is variable, and the intellect may be relatively spared in some cases. Seizures may be observed later in the disease course and are typically responsive to anticonvulsants. The disorder is similar in many ways to NAD, except that neither the peripheral neuropathy nor the profound axial hypotonia observed in NAD is a feature. 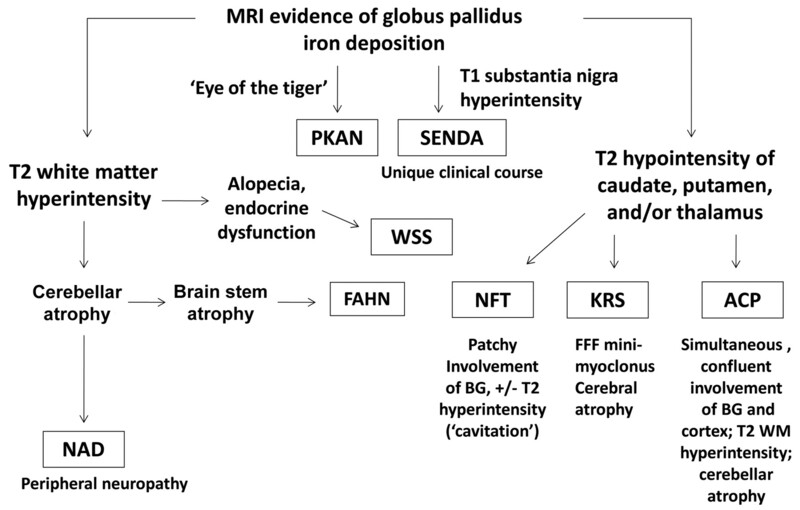 Neuroimaging features of FAHN include the characteristic presence of iron in the globus pallidus. The substantia nigra may be affected to a lesser degree. Other features include confluent subcortical and periventricular white matter T2 hyperintensities along with thinning of the corpus callosum. Cerebellar and brain stem atrophy increase with time and may be profound (Fig 7). FAHN. Evidence of iron deposition in the globus pallidus (A) and, to a lesser extent, the substantia nigra (B) may be seen on T2-weighted images. C, Confluent white matter abnormalities may be apparent on T2/fluid-attenuated inversion recovery sequences. D, Mild cerebral atrophy may occur, along with significant pontocerebellar atrophy and thinning of the corpus callosum (A). KRS, originally identified as a parkinsonian syndrome, has recently been characterized as a form of NBIA.30,31 KRS is caused by mutations in the ATP13A2 gene. Clinical features of KRS include prominent parkinsonism (hypomimia, rigidity, festination, and bradykinesia), anarthria, spastic paraparesis, and pyramidal tract signs. Dementia is part of the typical constellation of symptoms. Distinguishing features include a supranuclear gaze palsy, oculogyric crises, and facial-faucial-finger minimyoclonus. Aggression and episodes of psychosis, including frank hallucinations, may occur. Evaluation of MR imaging findings may disclose generalized cerebral, cerebellar, and brain stem atrophy, along with progressive atrophy of the pyramids. Globus pallidus, caudate, and putamen T2 hypointensity justifies consideration as an NBIA disorder (Fig 8). KRS. Globus pallidus, caudate, and putamen hypointensity may be seen on T2-weighted images (A and B), in addition to generalized cerebral and cerebellar atrophy (A and C). The most atypical of the NBIA disorders, WSS, nevertheless, may feature prominent globus pallidus iron accumulation (Fig 9), though this may be an inconsistent feature. Widespread confluent and marked periventricular T2 white matter hyperintensities are typical findings. WSS. Extensive confluent white matter T2 hyperintensity is typical of the disorder (A and C), while hypointensity of the globus pallidus on T2 sequences is an inconsistent feature (B). Images courtesy of S. Bohlega. SENDA begins with early childhood intellectual impairment. Unlike the other forms of NBIA, however, the cognitive dysfunction remains nonprogressive, sometimes for decades, after first being recognized. Then, in adulthood, affected patients develop severe dystonia-parkinsonism, and later exhibit signs of a progressive dementia.34 No etiology has yet been identified for SENDA. The neuroimaging of SENDA is distinct. In addition to iron deposition in the globus pallidus and substantia nigra, SENDA features T1 hyperintensity of the substantia nigra with a central band of T1 hypointensity (Fig 10). Significant cerebral and milder cerebellar atrophy also occur. SENDA. 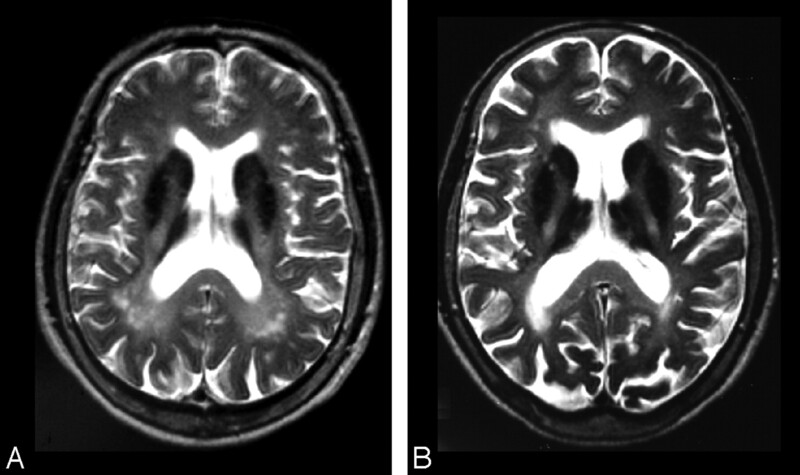 Hypointensity of the globus pallidus (A) is overshadowed by that of the substantia nigra and cerebral peduncles (B) on T2-weighted imaging. C, T1 sequences demonstrate hyperintensity of the substantia nigra and cerebral peduncles with central linear hypointensity. D, Global cerebral atrophy is also a feature. MR imaging is of tremendous utility in the evaluation of brain iron disorders and facilitates clinical diagnosis. Despite its usefulness as a biomarker, the pathophysiologic role of iron deposition in NBIA remains uncertain. Associated MR imaging abnormalities may help to distinguish subtypes of NBIA and facilitate a more definitive diagnosis (Table 2). New applications of MR imaging in NBIA, including the evaluation of disease evolution in clinical trials and the quantification of iron content in vivo, may facilitate efforts to develop treatments for these devastating diseases. We acknowledge the graciousness of P.F. Chinnery and H. Miyajima in providing images of NFT and ACP, respectively, and of S. Bohlega in providing images of WSS. M.C.K. is supported by the NBIA Disorders Association and Associazione Italiana Sindromi Neurodegenerative da Accumulo di Ferro, American Academy of Neurology (Clinical Research Training Fellowship), American Philosophical Society, and Medical Research Foundation of Oregon. M.C.K. also receives support through the Oregon Clinical and Translational Research Institute as an OCTRI Scholar (National Center for Research Resources grant UL1 RR024140) and through an National Institutes of Health Loan Repayment Award (UWXY3099). H.H. is supported by the UK Medical Research Council (fellowship, G108/638 and G0802760). S.J.H. is supported by the NBIA Disorders Association. A portion of this work was undertaken at University College of London/University College of London Hospital, which received a proportion of funding from the National Institute for Health Research Biomedical Research Centres funding scheme of the Department of Health. Disclosures: Michael C. Kruer, Research Support (including provision of equipment or materials): EMD Serono, Details: research (grant) support. Henry Houlden: Research Support (including provision of equipment or materials): Medical Research Council UK and Wellcome Trust, Details: grant support. Kailash Bhatia, Research Support (including provision of equipment or materials): Ipsen Ltd, Wellcome Trust, PD Society; Dystonia Society, UK, Details: research unrestricted grant (Ipsen Ltd); grant support (rest); Speaker Bureau: GSK, Ipsen Ltd, Merz, UCB Pharma, Orion, Details: received honoraria for speaking at meetings by the above companies. William Rooney, Research Support (including provision of equipment or materials): National Institutes of Health, Details: extramural research support, Ownership Interest: DeltaPoint Inc, Details: start-up company in which I own stock. Penelope Hogarth, Research Support (including provision of equipment or materials): 1) Schering Plough Research Institute; 2) Michael J. Fox Foundation, Details: 1) research contract paid to my institution for a proof-of-concept study in Parkinson disease; 2) research grant paid to my institution as a participant in a multicenter study, Consultant: 1) Schering Plough Research Institute, 2) Apopharma, Details: 1) under $10,000 paid to my institution for consultant services related to Parkinson disease study design; 2) under $10,000 paid to my institution for my participation in a scientific meeting related to deferiprone use in NBIA. Susan Hayflick, Research Support (including provision of equipment or materials): philanthropy.
. Defective FA2H leads to a novel form of neurodegeneration with brain iron accumulation (NBIA). Ann Neurol 2010; 68: 611– 18.
. Childhood static encephalopathy and cerebral palsy followed by abrupt-onset progressive neurodegeneration in adulthood: a novel neurodegeneration with brain iron accumulation (NBIA) phenotype. Poster presentations, American Academy of Cerebral Palsy and Developmental Medicine 63rd Annual Meeting, Scottsdale, AZ, September 2009. Accepted after revision December 8, 2010.